Chris was born in North York Ontario, at the age of 1 moved to Port Sydney. Attending V.K. Greer Memorial Public School from J.K. to grade 8, he then attended Huntsville High School graduating in 2004. From high school he went to Lynchburg Virginia, attending Liberty University, graduating with honors with a Bachelors of Science in Biology with Pre-Med concentration. 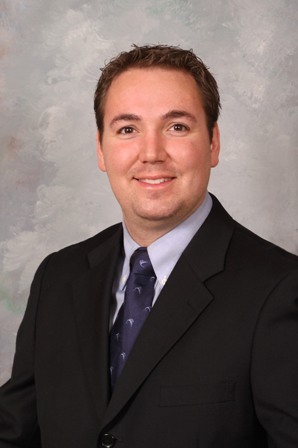 In 2008 Dr. Pearce began dental School at University of Detroit Mercy School of Dentistry graduating in 2012. The University of Detroit Mercy School of Dentistry is a state of the art facility. Dr. Pearce was in the first class to enter the school after its move to a new location. Accompanied with the move was the newest and best technologies available. Digital charting, x-rays, Cad-Cam/Cerac machines to name a few. Detroit Mercy has a unique patient population not seen in most other cities. This allows for a overwhelming amount of clinical experience to its students, which Dr. Pearce took full advantage of while attending. In the summer of 2011, Dr. Pearce went on a Mission trip to Honduras with the Christian Dental Association. Working with missionaries and 15 dental students, mobile clinics were set up in rural Honduras providing essential dental care to the population. This included extractions, fillings, cleanings and even root canals! Following graduation Dr. Pearce worked continuously at a clinic in Flint Michigan. The main goal of the clinic is to attend the needs of the underserved population of Flint. While working there, Dr. Pearce strived provide the best service possible to his patients. He gained experience in fillings, surgical extractions including impacted wisdom teeth, root canals, dentures and crowns. Dr. Pearce looks forward to serving the community of Huntsville in the coming years, striving to provide the best dental care available!